This product is End-of-Life. Please contact our Sales Department for the recommended replacement or consider. The Em104-i613 utilizes an onboard Intel Ultra-Low Voltage Fanless Celeron 400 or 650Mhz CPU, along with the VIA Twister chipset, making the Em104-i613 one of the smallest and most powerful SBCs on the market. Unlike other high-end PC/104 SBCs, the Em104-i613 maintains the true PC/104 standard form-factor and does not require “wings”. The Em-i613 gives developers a low power, high performing and scalable platform with superior graphics capabilities that can fit into the tightest places. The Em104-i613 utilizes an onboard Intel Ultra-Low Voltage Fanless Celeron 400 or 650Mhz CPU, along with the VIA Twister chipset, making the Em104-i613 one of the smallest and most powerful SBCs on the market. Unlike other high-end PC/104 SBCs, the Em104-i613 maintains the true PC/104 standard form-factor and does not require “wings”. The Em-i613 gives developers a low power, high performing and scalable platform with superior graphics capabilities that can fit into the tightest places. 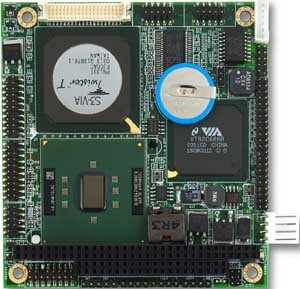 PC/104- I/O expansion allows features to be quickly added using any one of EMAC’s many PC/104 expansion modules. 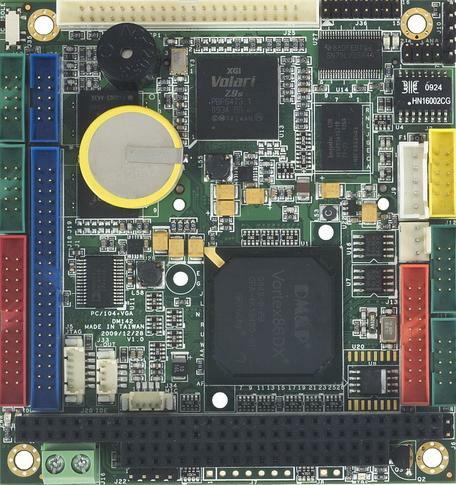 The Em104-i613 is perfect for applications such as military and industrial automation where uncompromised performance in a limited space is required. 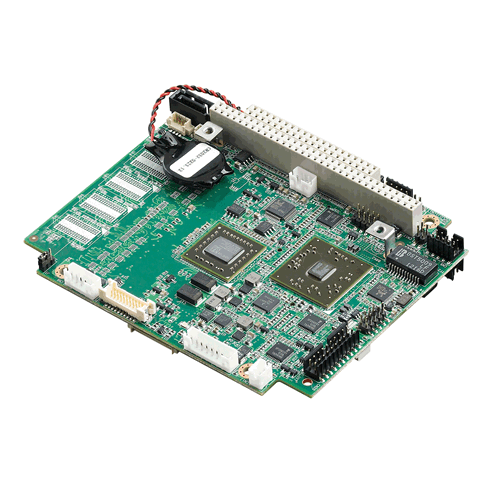 The Em104-i613 provides the quality features available on SBC boards several times its size. The VIA VT8606 Twister™ North Bridge with integrated Savage4™ AGP 4X 3D Graphics core maintains excellent graphics performance and provides VGA/LCD support up to 1280 x 1024. SDRAM memory capacity up to 512MB is large enough to drive the latest operating systems, including Linux, RTAI Real-Time Linux, Microsoft Windows XP/XPE, Windows CE.net, Windows NTE, and DOS 6.22. A CompactFlash socket supports Type I/II CompactFlash Cards, which can be used to eliminate the use of fragile hard disks, increasing reliability in harsh environments. Two USB 1.1 ports are available as well as one parallel port (SPP/EPP/ECP modes) and 2 high speed serial ports (RS-232 and RS-232/422/485). With its industrial grade reliability, the Em104-i613 can operate continuously at temperatures up to 104º F (40º C) without a fan and up to 140º F (60º C) with a fan. The numerous features provide an ideal price/performance solution for high-end commercial and industrial applications where stability and reliability (no moving parts) are essential.